HCAO-Rogue Valley issues this Call-To-Action to attend this city council meeting wearing your red HCAO Rosie the Nurse T-shirt to show support for Single Payer healthcare and a system that provides more care for more people for less money. 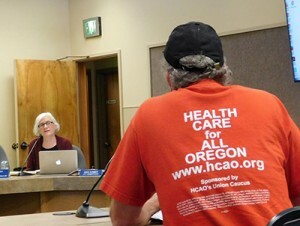 HCAO-Rogue Valley has an agenda item before the June 7 Ashland City Council, an advisory resolution to instruct the 2017 Legislature to design an improved comprehensive healthcare system for the State of Oregon. Click HERE to view the resolution. HCAO-RV is asking the City of Ashland to refer this resolution to the November, 2016 election so that Ashland voters can decide whether or not to send this advisory to the State of Oregon Legislature. ALL Southern Oregon residents are invited, we have a big opportunity for not just Ashlanders but the greater Rogue Valley. Come to the 7PM, June 7 Ashland City Council meeting and wear a red shirt! HCAO-RV still has red Rosie the Nurse t-shirts for sale. Please contact Wes Brain to get yours, brain@mind.net or call 541-482-6988.